Are you a caring and patient person who loves to work with children? Are you seeking a part-time opportunity that keeps your mornings and afternoons free? 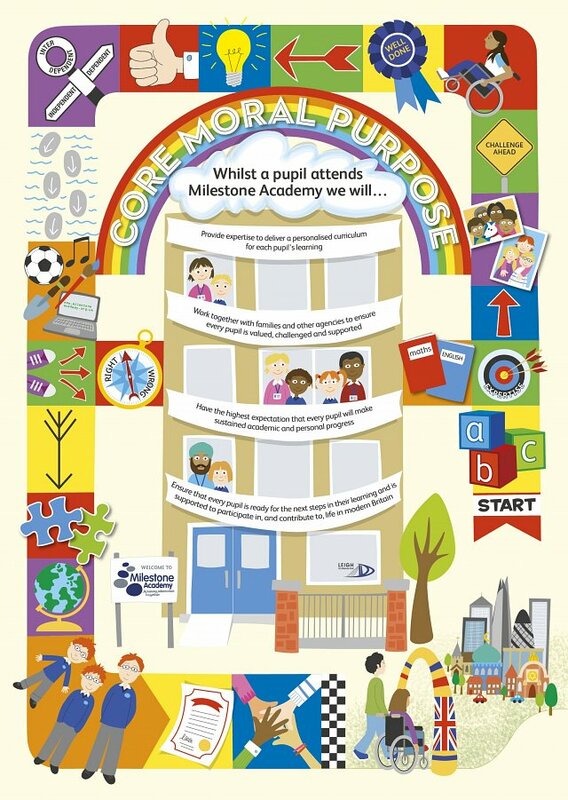 Milestone Academy are now accepting applications for the role of Midday Supervisor; our successful candidates will join our support team on a permanent basis, working 10 hours per week during Term Time between the hours of 11.30am - 1.30pm, plus 5 days inset when we deliver the majority of our training sessions. This is an exciting opportunity to consider joining us so please take a close look at the role details and if you feel you have the necessary attitude and experience then we would love to hear from you. Please note that the successful candidates will be based at our satellite location which is The Leigh Academy in Dartford. This role is suitable for those who genuinely have a passion for helping children, particularly with learning difficulties. The actual salary (taking into account the part-time hours and Term Time working pattern) is £3,573 per annum which is equivalent to £8.12/hour. Please note that interviews will be conducted on a rolling basis - early applications are encouraged. Help our students reach their full potential: Milestone Academy is a large, modern, well-resourced academy and we provide specialist education for 330 pupils with profound, severe and complex needs. We're based in a semi-rural setting and fully have fantastic facilities, both indoors and outdoors that our pupils make use of. Our pupils are aged between 2-19 years and we have additional satellite provisions in other academies who are part of Leigh Academies Trust. We have a commitment to pupils and families to deliver personal and academic progress for each pupil whilst there are with us. We are immensely passionate about what we do, and equally proud of what we achieve on a daily basis with our pupils. Ensure pupils enter the dining room in a safe and orderly fashion and behave appropriately when queueing for their meal in order to maintain the safety and wellbeing of all pupils. Ensure there are the correct number of chairs for pupils and that there are sufficient settings for the number of pupils eating that day. Ensure pupils eating meals are seated in an orderly fashion to maintain safety and wellbeing of the pupils. This may include checking that pupils have or are provided with a drink and that a sufficient amount of their meal has been eaten. Assist the pupils, as necessary, during the meal break to ensure their wellbeing, providing them with a drink, helping with spillages, cutting up food and caring for pupils’ personal needs. Assist pupils in walking/transitioning from their classroom and supervise school areas used by the pupils at mealtimes, to ensure safety and appropriate behaviour is observed, as applicable. Be prepared to support pupils with their personal care needs, cleaning their face and hands after dinner, taking to the toilet. Supporting with learning in the class where appropriate, to support pupils in their learning of daily living and social skills by talking to them about their lunchtime routines and what they are eating, doing, playing. Each and every member of staff, regardless of their position or seniority, is expected to participate in the overall running of the school and to act as a positive role model for our students. In and out of the classroom you will encourage and promote positive behaviour and effectively manage any situation that threatens to impact on the progress of other students. What are we looking for in you? Applicants will have previous experience of working with young people, either in an academic setting or as a voluntary worker. You will be committed to personal learning and development, and have a sincere commitment to sharing our long-term aims and drive for continuous improvement. In return, we will offer you a professional and supportive team, a state of the art working environment and a genuine opportunity to develop. As a Trust we feel it is important to hire for the right attitude which is why we look for support assistants that are enthusiastic, focused and resilient to the day to day pressures that the classroom brings. Diversity at our core: As a Trust we are passionate about diversity and recognise that as individuals we all bring something unique to the role regardless of age, gender, race, beliefs or disabilities which is why we treat all of our people equally, without compromise. The Academy is committed to safeguarding and successful candidates will be subject to an Enhanced DBS check. Address: Ash Road, New Ash Green, Longfield, Kent, DA3 8JZ, United Kingdom.